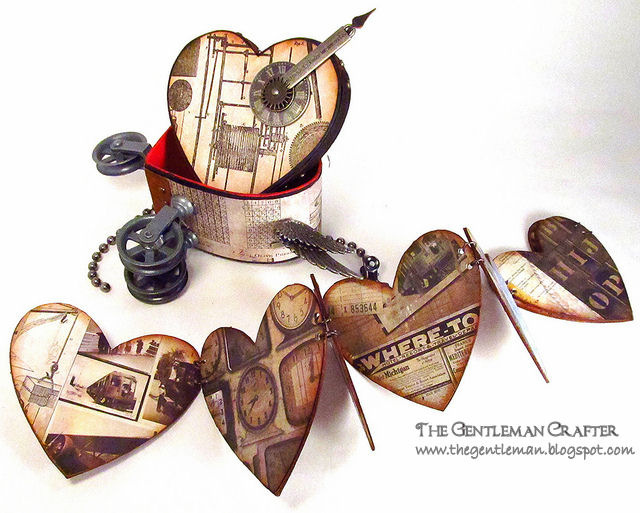 The Gentleman Crafter: Simon Says Stamp Guest Designer Project!-Done! If you have been following my blog, you know that this week I'm the guest designer at Simon Says Stamp's blog. I hope you like it and once again please go to Simon Says Stamp to download the full tutorial. Have an AWESOME day! I heart ya! You've done it again my friend! 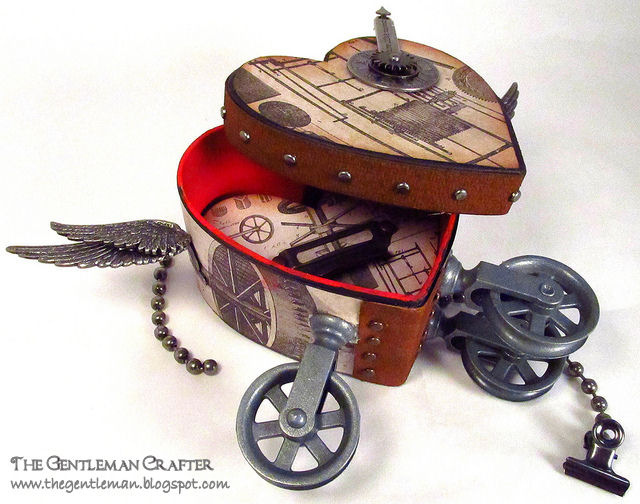 So steampunky and cool. Looking forward to seeing the full details later. You rock! Amazing! You never disappoint us. Thank you for sharing. Very cool. I am going to have to get out the dictionary because I am running out of words to describe your awesomeness (or make up my own...bahawaaa!). Hey Jimbo! Show us your decorations!! This is my week to decorate and I am needing some inspiration! Because of you last year, I got out my "pretty" ornaments this year. Now I need to do the rest of the house. And remember, I only give myself one week and that's it. So get those pics posted! I would hate to wait a year to copy you! Wow,Wow,Wow!!! This is my favorite! 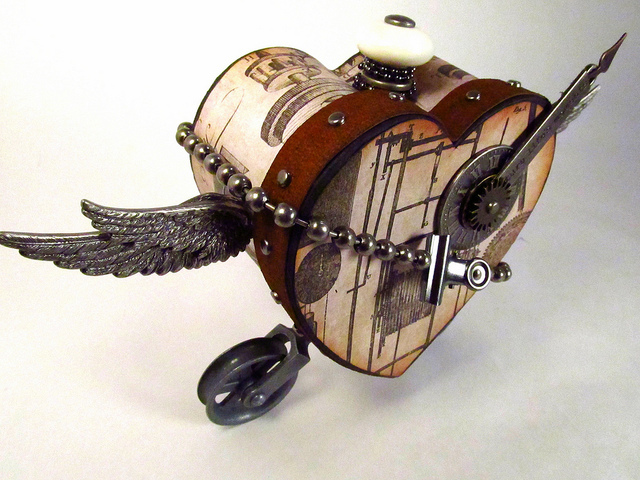 Steampunk and hearts-doesn't get any better. Wow! WOW!!!! This is one of your very best!!! Absolutely LOOOOOVE it. Thanks you so much for your great blog, ideas and wonderful narrative. That is amazing. I will pop over to Simon Says Stamp and pay you a visit there. 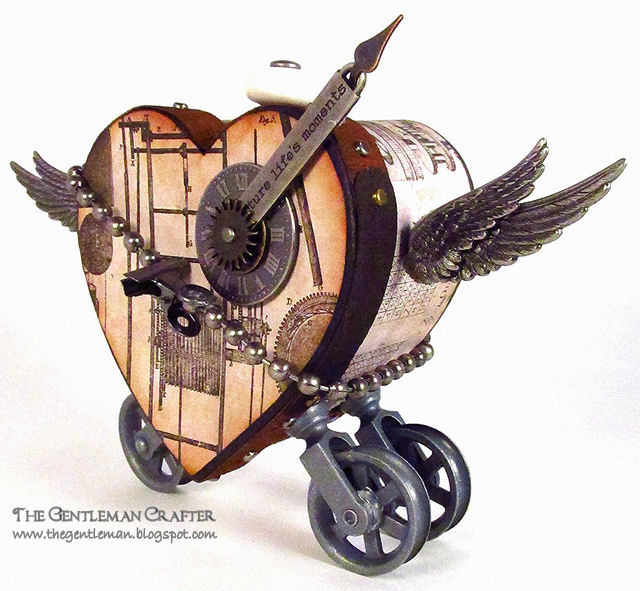 Steampunk is just so fun. 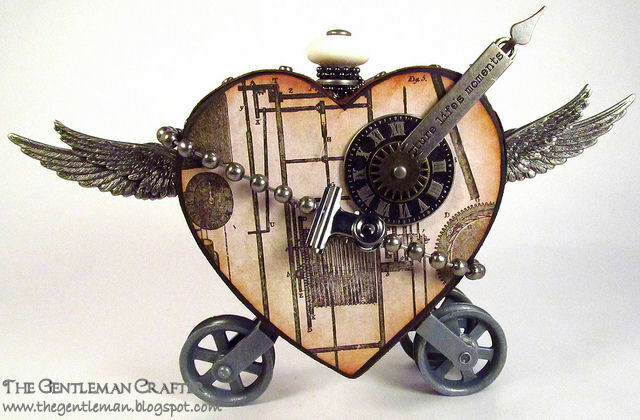 Love the wheels, the brads, the colors, the book, just all the stuff on this heart box. Great job. One awesome heart! Very cool project! Thanks for sharing! I have just left a comment on FB but I come up as different name on blogs so I can gush even more, lol. I'll just say it again. Jim, YOU TRULY DO Take my breath away!!!!!!! As I said on FB, LOVE IT!!!!!!!!!!!!! Hey, me again. Just back from Simon Says. The details are just amazing. I'm thinking this would make a great class. Oh my goodness! Well, of course there is a mini album inside! Even more fabulous! Wow! What a well thought out & clever piece, Jim! I really love all the embellishments you added! Welcome! We're honored to have you as a guest! Jim this project is incredible!!!! I absolutely LOVE it!!! Thanks so much for inspiring me once again! Fantastical, amazing and I love it. I have totally run out of words to describe how your work looks....wow, fantastic, super, amazing, beautiful, creative, gorgeous, superb...all describe your projects each and every time you post a new one. Keep'em comin'...I'll try to find more words. Thanks for the step out tutorial over at SSS! Thank You Everybody! So appreciate your comments and especially that you took the time to go over to Simon Says Stamps to check it out! Y'all Rock! Fantastic! This is just over the top wow! So pleased that you shared it with us at Simon Says Stamp and Show this week! Jim, this piece was fabulous when you first rebealed it to us as just the box with the promise of an album inside, but now with the album it is absolutely fantastic! This is definitely something I could do for my neighbor girl. She'll be head over heals for this one. Thanks! Wow, I love Hearts! I sure would like to have like this...tee hee ;o) Love it. Another fabulous project, love it! This has Valentine's Day gift written all over it, Jim. My favorite is the 3-wheeled tricycle part. Great news about the hitch posts. I'd love to have been a fly on the wall during your Skype to see what new goodies Tim has for you to work with for CHA. Patience will have to become one of my virtues. Lol. Love it, love it, love it. Such a great use of materials. And I have like the Simon Says heart inspiration all week too. thanks as always for sharing. Wow... love this cool box and mini! 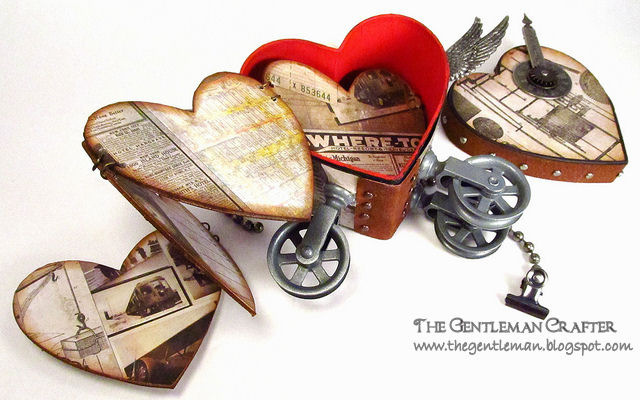 Okay, thus far this is my very favorite project of yours, it's another amazing project by "The Gentleman Crafter". You should call yourself the "Gentleman Artiste" because you truly are an artist. This turned out just beautifully! !